Dead people like Anna Dressed in Blood, a beautiful, murderous ghost entangled in curses and rage. She still wears the dress she wore on the day of her brutal murder in 1958: once white, now stained red and dressed in blood. Cas knows he must destroy her, but as her tragic past is revealed, he starts to understand why Anna has killed everyone she's ever met. Everyone, that is, except Cas . . .
Visit Kendare Blake's website for more information. Cas comes from a family of ghost hunters and his early life was spent moving around the country with his parents while his father killed dangerous ghosts. Since his father was killed by a ghost Cas has taken over his role and now travels with his mother searching out ghosts. His latest tip has sent him to Canada searching for Anna Dressed in Blood. Anna was brutally murdered over 50 years ago and since then has been haunting the house that she used to live in, anyone who tries to enter her home is viciously torn to pieces. It is up to Cas to permanently destroy Anna before she can murder anyone else but the more he learns about her past the more he starts to feel for her. Hasn't she already suffered enough? Is there any other way to stop her? 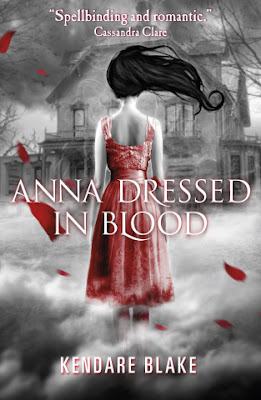 I have been looking forward to reading Anna Dressed in Blood ever since I first heard about it after it's US release so I was really excited that the book has finally been published in the UK. I love reading stories told from a male perspective and Cas was a great hero for this story. I was a bit nervous about him at first because he comes across as quite arrogant and over confident but as you get to know him you learn how brave, smart and kind he is. Having always moved around he is used to changing schools and although he never bothers to spend time making friends he immediately makes himself at home. He knows the best way to get the information he needs about Anna is to be accepted by the popular kids so he instantly makes a connection with the queen bee Carmel. His latest job turns out to be quite different from the previous ones though. Not only does he find himself actually starting to make friends and let people in on his secret but there is also something very different about Anna compared to all of the other ghosts he has ever had to deal with. She is more aware of what she is for a start but she is also more violent and much more powerful than any that he has come across before and it isn't going to be easy to stop her. I really loved the mythology that Kendare Blake has used to create the world Cas lives in. I thought the way that most of the ghosts who become violent were originally victims themselves who now spend their afterlife reliving their most horrific moment and killing people in the way that they died was really interesting. It made sense to me that their pain, suffering and confusion caused them to become something that they never were in life. The one thing about the book that I wasn't so keen on was the romance. Call me stupid but I found it hard to believe that Cas would be attracted to a ghost who he knows has committed multiple murders and who he actually watched rip someone in half! As much as Anna's back story was tragic and made me feel sorry for her it doesn't change the fact that since her death she has become a murderer herself. Although I felt she deserved to find peace I just didn't believe the romance and I found it more than a little creepy. Anna does make a fantastic scary ghost though and there is no way you'd get me to step foot inside her haunted house! Overall I really enjoyed Anna Dressed in Blood and am looking forward to reading the sequel. The story is fast paced, gory and different from anything else I've read recently. If you like your ghosts scary and don't mind a lot of blood and guts in your books you'll really enjoy this one! Source: Received from Orchard in exchange for an honest review. I was surprised by how much I enjoyed this book because I'm such a wimp. Even the romance mostly worked for me because I wanted Anna to find some peace and happiness after the misery of her short life. I got this one in the past this morning and hope to get to it soon :) Thanks for the review! @ Bookworm1858 - I really enjoyed the storyline but could have done without the romance but that is down to personal taste so I'm glad you enjoyed that part more than I did. I really did feel that Anna deserved some peace after everything that had happened to her but she was still a murderer who killed innocent victims LOL. @ Krystianna - I'm glad you like my review & I hope you enjoy the book. Please come back and let me know what you thought of it when you've finished reading.